For the first time since George Brett, Nolan Ryan and Robin Yount were inducted in 1999, three players were inducted today to the Baseball Hall of Fame on their first time on the ballot as the 2014 class is Greg Maddux, Tom Glavine and Frank Thomas. It is the largest class since the aforementioned 1999 class and already one of the better Hall classes in history. And we came extraordinarily close to the first four player class since 1955 as a crowded ballot left us with some interesting results. Here are my reactions to this year's vote. This is an excellent class and all three, Maddux, Glavine and Thomas, are all more than deserving to get to Cooperstown. Maddux should have been unanimous, you cannot make a legitimate case that he, one of the elite pitchers of all time, especially one without the dominant fastball as so many other great pitchers, is not deserving of the Hall. Of course, he was not unanimous because some writers are clowns are refuse to allow a guy go in unanimously or just because they want their ballots to make news for hideous reasons. Thomas was, by every metric you can think of, a dominant and an elite hitter and one of the greatest hitters in history. He stood out when he played, and that is more of a big deal than one would think when you play in an insane offensive era that the Big Hurt played in. And why was he never surrounded by the rumors that tainted so many of his colleagues? It's hard to find a complete and conclusive answer, but the fact that Thomas was an outspoken supporter of testing during the 1990's has to help. 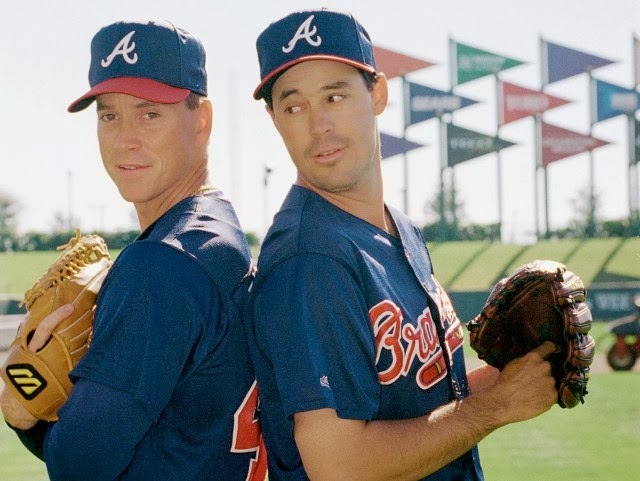 I absolutely considered Glavine a Hall of Famer, but not necessarily as a slam dunk as others did; rather I thought it was more of a putback or even a lay-up. Of course, the 300 wins helped him get to north of 90% to sail into Cooperstown and he was a brilliantly durable and extremely consistent pitcher that, once again, excelled in a tough offensive era. Craig Biggio was the guy who came an excruciating two votes shy of enshrinement and that was due to the fact that it was a very strong ballot with the maximum of ten guys on any ballot, a truly silly rule in my humble opinion, leaving him off some ballots of writers that did feel that he was worthy of enshrinement (it happened on my hypothetical ballot). Biggio was also hurt by some clowns that pulled a variety of crap that the great Craig Calcaterra broke down here. He is a guy that a lot of folks oppose his candidacy because of the point that he never really was a dominant player. I think it's a fair point, although it's not one I agree with because generally people do not consider second basemen dominant, and dominance is highly subjective and inconsistently defined. I do think Biggio is a Hall of Famer, and it isn't due to just the 3,000 hits. He was an excellent offensive player, initially at catcher and then at second base (and solid in the outfield as well), both tough offensive positions. He excelled at getting on base, hit for power (would have had more homers had the Astrodome not been a tough hitting park) and was very good on the bases. He is Hall worthy in my eyes and he will get in next year. It's still insane that Mike Piazza (62.2%) and Jeff Bagwell (54.3%) have not gotten in yet due to the ludicrous "suspicions" that both used performance-enhancers without much of any sort of evidence (and no, Piazza's "backne" is not legitimate in the slightest) as both are clearly Hall worthy. Piazza may a jump this year and he'll get in next year or more likely in two years and Bagwell will eventually get in as well, but their wait is ridiculous and just about disgraceful. One of the headlines will be how Barry Bonds (34.7%) and Rogers Clemens (35.4%) both dipped a little in their voting. Obviously two of the biggest names on the ballot and tainted with all the PED talk (although neither have a positive test). I mean, there have been guys for over 50 years that have used amphetamines including many notable guys in the Hall, and when you take out their widely suspected years of using steroids, they are still clear Hall of Famers. Will either make the Hall? I think they eventually will because I think some writers just wanted to give them this initial slap on the wrist before ultimately voting for them, but if they do get in it will take years if at all.